This is my very, very cluttered office and soon to be baby's room. This is a massive job, as you can see there is a lot of big bulky stuff in here that will need to be sold or moved to another part of the house, and well to be honest, there isn't a lot of room in the rest of the house! The plus side is that at least it is in the right colour scheme, although I am debating painting the hogsbristle wall (window wall) a nice dark grey. I want to say that I am not really panicking about getting everything ready on time, but that would be a lie. I think about it constantly! This is from the gallery at Project Nursery: I think I have that same chest of drawers already! Bonus. What I am really in love with is that amazing retro rocking chair. I would LOVE to find one of those, amazing. Seeing I am all about Embroidery! This room from DesignDazzle takes my breath away. I actually think I will do this, and I already have recruited a couple of volunteers to help! Would go so well with a retro theme as well! Project Nursery: Blackboard Paint!! How fun.. kids (and Mums and Dads) can drawn on the walls and then wipe it right off! I love this idea, I am not sure about a whole wall, but it needs to be incorporated somehow! TEEPEE!!!! I saw this in a magazine a couple of months ago and really thought it was a fantastic idea. I guess it wont be used for a little while so there is no rush, but what a fun D.I.Y project for later on. 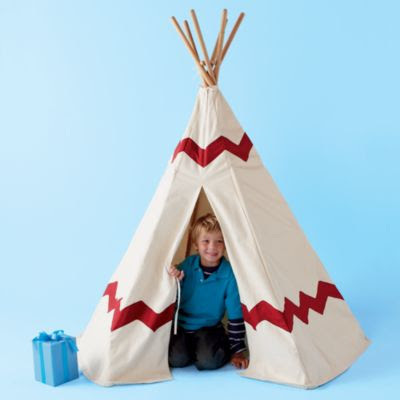 I can imagine little boys loving their own indoor teepee! 1 comment on "New Project: Baby Nursery!!" You have some really great ideas brewing Karen! I can't wait to see the end result!! !